Koi fish predators are everywhere when it comes to koi ponds but how do you keep and protect your koi fish from predators. First off some koi predators are raccoons, snakes, frogs, cats, kingfishers and the worst predator of all the blue heron. All of these predators pose some risk to your koi but what can a pond owner do to protect koi from being eaten. The first thing to protecting your koi from predators is getting to know the predator themselves. 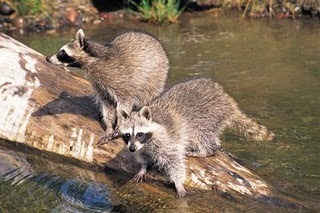 One thing that a raccoon is afraid of is deep water as they usually fish in rivers from a log or in shallow water. What a koi owner can do is when planning your pond at the beginning is to make sure you leave steep edges that will help stop or prevent racoons from fishing for your koi and help keep your koi fish safe from predators. The worst koi fish predator of all is the blue heron. Herons can literally wipe out a whole pond before you even know they were there. These birds look magnificent but to me it’s my worst nightmare being a koi breeder myself. I’ve seen these herons try and come eat my koi on a daily basis multiple times a day. The good thing is that there are certain things koi pond owners can do to help protect their koi fish from predators. 1. Set up pond netting over your garden pond to protect your koi fish. 2. Place koi castles or tunnels in the pond so they can have a place to hide. 3. Set up a scarecrow sprinkler system that’s motion activated that scares those nasty little koi fish predators. 4. Set up fishing line spaced very close together. Once the birds feet hit the fishing line it scares them away. 5. Install a floating alligator head or hippo in your pond as this will scare pond predators away. 6. Install koi decoy in pond that will help protect your koi fish and give them a chance. 7. Install a Garden Defence Electronic Owl that will help deter pond predators from coming and eating your koi fish. 8. Install a Heron decoy that will help deter herons from stopping by your koi fish pond. 9. Get a dog! Your pet would one of the best ways to keep wildlife away from your pond. Hopefully he’ll stay out of it too! 10. Buy yourself a ultrasonic sound device that sends noise only wildlife can hear. This will keep pond predators away too. Animal Away is a great animal control product that works well.